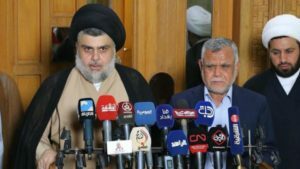 Iraq’s vibrant Shia Cleric Moqtada al-Sadr and Iran-backed militia chief Hadi al-Amiri Tuesday announced their alliance in the hope to form a new government following contested May elections won by the anti-US and anti-Iran nationalist Cleric. The announcement made in the Shia holy city of Najaf will bring together Sadr’s Saeroon bloc and Hadi al-Amiri’s Fatih, come respectively first and runner-ups of May 12 elections. Sadr at a press conference pointed out that their alliance is meant to end the suffering of the Iraqi nation. Amiri heads Iran’s closest Iraqi political grouping, Fatih. Fatih is an Iran-backed militia that, alongside the army, fought the Islamic State group which was defeated in December following nearly three-years of fierce fighting. After coming together, Saeroon and fatih now have 101 seats in Parliament, but still need more seats to form a government. They have called on other blocs to join the alliance. The announcement of the alliance came following reports of arrival in Iraq of the head of Iran’s Revolutionary Guards commander Qassem Soleimani for a meeting with Shia political leaders. The alliance also emerges as a bloc against calls for a rerun after warehouses where the elections ballot boxes were kept caught fire. The incident took place few days after the parliament mandated a manual recount of the votes over allegations of massive fraud. The interior ministry said no ballot box was destroyed, and noted that four people were arrested in connection with the incident. Some parties which did not fare well during the polls called for a rerun. Sadr and Amiri have opposed the call. They have been joined by outgoing Prime Minister Haider al-Abadi. Abadi on Tuesday said he opposed a repeat, echoing the stances of Sadr and Amiri, and warned that anyone who tried to sabotage the political process would be punished, Reuters reported. Written by: KanelkaTagba on June 13, 2018. Posted by KanelkaTagba on Jun 13 2018. Filed under Headlines, World News. You can follow any responses to this entry through the RSS 2.0. Both comments and pings are currently closed.